SAN FRANCISCO, CA--(Marketwire - May 20, 2008) - Mindjet® Corporation, a global leader in software that lets people organize and express their ideas visually, today announced the acquisition of JCVGantt® Pro 3, a project management software application from Gantt Solution. The acquisition makes MindManager an even more powerful option for professionals who need more sophisticated project management capabilities, but prefer the ease, speed, and clarity of working in a map. For the over one million Mindjet customers worldwide, MindManager is a powerful alternative to traditional presentation and word processing programs, and allows them to create visual maps for a wide variety of personal and professional purposes. The combination of MindManager and JCVGantt lowers the expert-only barrier to task management and project planning, giving all professionals the advantage of fundamental project management functions. It gives project managers and teams a way to visually capture information and ideas related to project requirements, identify resources, plan schedules, and manage throughout the project lifecycle. The products instantly synchronize so MindManager brainstorms automatically produce project plans. JCVGantt instantly adds value by adding a whole new dimension to MindManager Pro. "This is a fantastic idea. I love how the product continuously syncs with MindManager. It's fantastic how it picks up Gantt bar colors from the branches of the tree. Overall, this is a real winner," commented Mark Mosher of Newecho Productions. "This has got to be the easiest tool I've ever used to create Gantt charts. Good job, guys," said Stephen Owens, President of Corner Software Development. "The JCVGantt acquisition expands Mindjet's product portfolio and extends our value proposition for anyone involved in managing projects -- from the simple to the complex," said Scott Raskin, Mindjet CEO. "JCVGantt is a natural fit in the MindManager environment where users are interacting with information from multiple familiar applications and productivity tools." 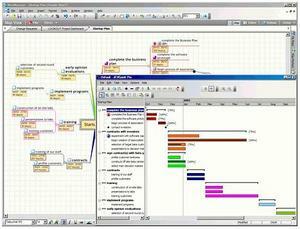 The JCVGantt Pro 3.0 standalone add-on application, compatible with MindManager Pro 7 in English, French, German, and Japanese is $129, and available through Mindjet at http://www.mindjet.com and through Mindjet's distribution channel. Mindjet makes software that helps people visualize and use information. Its leading product, MindManager software, enables individuals and teams to work smarter, think creatively, and save time every day. There are over one million licenses of MindManager software used globally by 85 of the Fortune 100 companies and more than 50 percent of Global 2000 organizations. Mindjet is headquartered in San Francisco with offices throughout the world and is backed by the leading international venture capital firms Investor Growth Capital, Inc. and 3i. For more information, visit www.mindjet.com.